Professional Surveillance Management Ltd has joined Secured by Design (SBD), the UK police crime prevention initiative. It’s the first remote monitoring CCTV company to have achieved Secured by Design’s Police Preferred Specification. They offer surveillance services, whereby when an intruder breaches a restricted area of a premises (by triggering motion sensors), an alarm containing CCTV images goes to PSM’s NSI Gold-accredited 24 hour Remote Video Receiving Centre (RVRC). Operators visually verify the cause of alarm and take action – such as issuing audio warnings, to tell intruders that they are being monitored and warn that the emergency services have been called. PSM’s operations, including alarm receiving software, is created, developed and controlled in-house. Software can be adapted to suit client and installer needs, rather than them having to fit into ‘off the shelf’ software. And Kerry Jones of PSM said: “Since its inception the entire focus of PSM has been to prevent our clients suffering from criminal activities, whilst liaising with the police in a timely and appropriate manner. 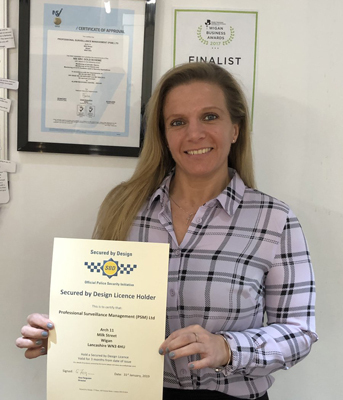 It is with that background that the team and I at PSM are delighted to be the very first remote monitoring CCTV company to have achieved Secured by Design’s Police Preferred Specification. We are wholly committed to delivering exceptional service and this recognition by the police owned national crime prevention initiative is a testament to the skill and dedication of our team. A police-owned organisation, it works on behalf of the police to deliver a range of crime prevention and demand reduction initiatives. Products are subjected to testing and auditing by an accredited third party before being allowed to carry the SBD logo.